1. Inside this egg shaped sauna, multi-level wood seating with hidden lighting and patterned wood walls surround the fireplace. The fascinating egg can accommodate up to eight people at once. See more photos of this project, here. Designed by Bigert & Bergstrom. Photography by Jean-Baptiste Béranger. 2. Elish Warlop Design Studio created a line of modern wood window shades that are 3 dimensional tessellations and are made from walnut. See more photos of this design, here. Designed by Elish Warlop Design Studio. 3. 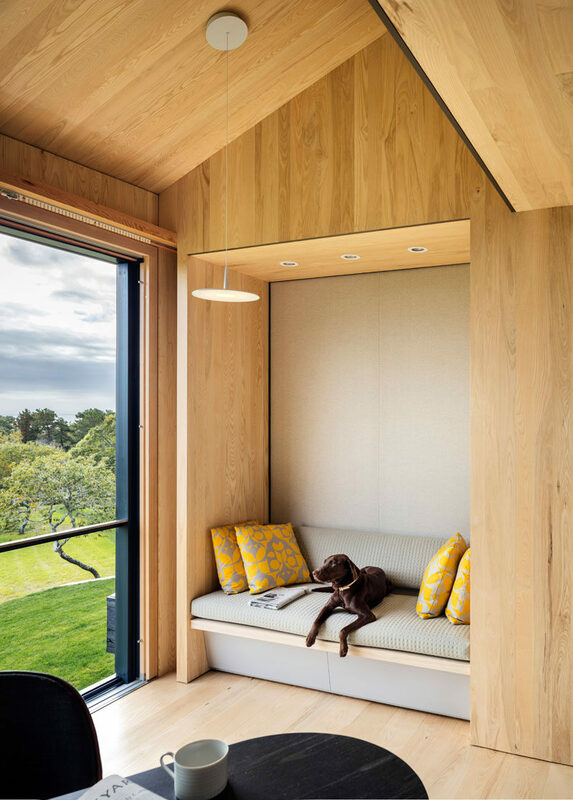 This built-in wood seating nook has a grey upholstery and yellow cushions for a pop of color. See more photos of this house, here. Designed by Schiller Projects and Gray Organschi Architecture.Photography by David Sundberg. 4. 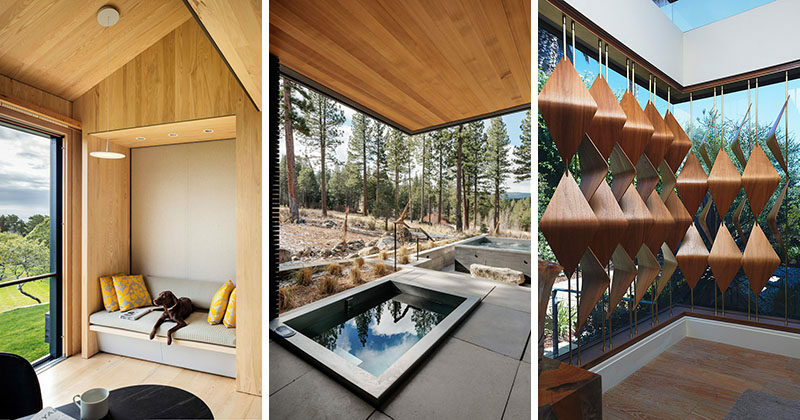 This modern house has an outdoor soaking tub with a black metal privacy screen that can be used when needed. See more photos of this house, here. Designed by John Maniscalco Architecture. Photography by Joe Fletcher. 5. This master bedroom, minimal in its design, has large walls of windows that open to let a cross breeze through. 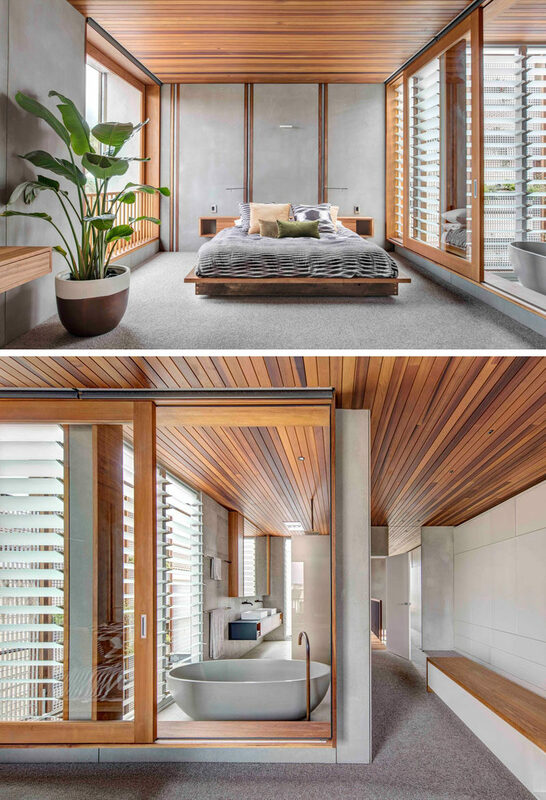 The wood ceiling continues from the bedroom through to the ensuite bathroom that’s separated by a large sliding glass window. See more photos of this house, here. Designed by CplusC Architectural Workshop. Photography by Murray Fredericks Photography.